Even if 2015 is already archived and overtaken by its younger colleague 2016, I still have some posts about last year…Please forgive me for my slight delay. One of the most typical “events” in Switzerland during the period before Christmas! The arrival of Samichlaus (Swiss German for Nikolaus) with his two faithful Schmutzli (“dirties”), to celebrate St. Nikolaus on the 6th December. Almost every small village, city or part of organised civilisation in Switzerland has its own “Samichlaus with Schmutzli” event. The origins of this celebration are not so clear and are to be found many many centuries ago. Basically, on the 6th December, Samichlaus, dressed more like a bishop than a Santa Claus, arrives with a big sack full of small sweets, chocolates, mandarins and peanuts for the joy of all children. He is always accompanied by two “Schmutzli”, characters wearing brown tunics and having faces covered with black dirty spots. 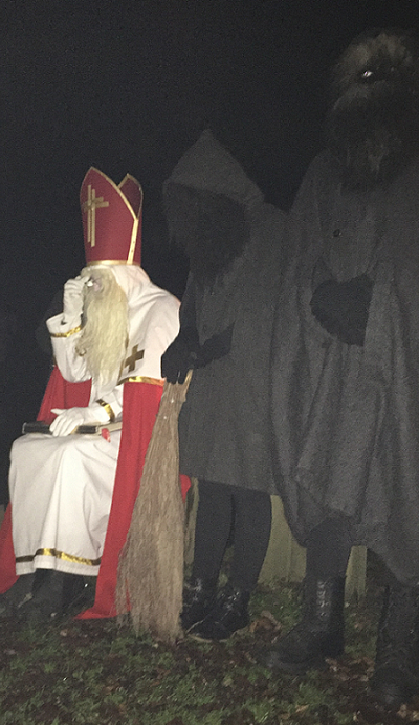 So this year, organised by the kindergarten, we were in the wood, in the evening, with the kids, with some fires to be able to see something and suddenly Samichlaus and its crew arrived and distributed his “sweet” presents in small bags to each kid. …apart from the quite boring (and sometimes seeming endless in the coldness of the evening) speech delivered by Samichlaus before handing over his presents! Of course: the speech was entirely delivered in the most possible strict Swiss German dialect! Yesterday my two year’s old daughter was very happy! With the Kinderkrippe they went to see a farm with animals. Nice, I thought: I wonder how many nice local and typical farm animals they could see…The teacher proudly informed me that, at the farm, they saw a camel!! Either my ear is becoming worse and worse, or I was particularly stressed after work, or Switzerland is really an…international country!